I saw the most anti-Christian meme the other day. …And it was a friend who was passing it around. That kind of troubled me. In fact, the longer I thought about it, the more bothered I became. I wasn’t really sure how to balance it either. Just how worked up should I get over stuff like this? Should I comment on their Facebook post? If anything, what should be said? The above is one of my personal favorites, if you can call it that. I see this one often. 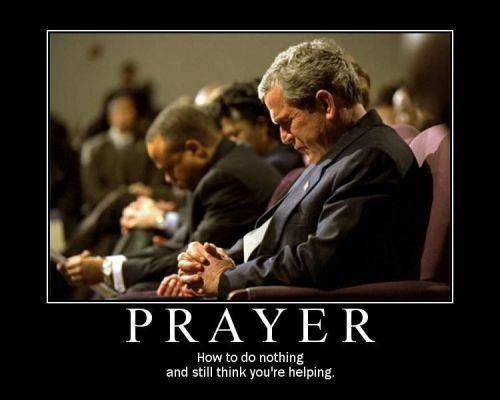 The silly notion that praying is a silly notion is enough to get me worked into a full lather. But I have to resist the autonomous response to react to things like this. Sometimes I even take on the blame of why a meme like this exists to begin with. Have we as Christians fallen short in spreading the Gospel that so much of this exists? In part, yes. Is that my fault? I suppose it is on some level. Have all the things I’ve done been in glory to God? That’s a serious question and one we should ask ourselves more than somewhat occasionally. Nobody said being a Christian was all fun all the time. In fact, lots of people for many years have been bruised, beaten, and far worse in defense of Christian Faith. Philippians 4:6 – Be anxious for nothing, but in everything by prayer and supplication with thanksgiving let your requests be made known to God. John 15:7 – If you abide in Me, and My words abide in you, ask whatever you wish, and it will be done for you. Mark 11:24 – Therefore I say to you, all things for which you pray and ask, believe that you have received them, and they will be granted you. Are tidbits of scripture like the popular ones above all lies? I sure don’t think so. I have Faith, therefor I believe. I’ve witnessed the healing and helping powers of prayer personally. There’s a connection we have with God. I also feel a connection with living things. If we could see the connection we feel with one another what do you think it would look like? Seriously. Ponder that. You love your wife, right? You love your kids, right? OK. That’s something you feel. Absent them you ache. Imagine for a moment that particular consciousness as something you could see. I can envision some sort of electricity or maybe a laser or possibly even a ripple or aura channeled between two souls joining them. You’ve surely witnessed a movie that used a special effect to help illustrate a connection or network among people. We sense that. We feel that. Those touches, physical or otherwise, are self evident. I ask you, why not a connection with others to Him through prayer? When Mira was sick there were literally thousands of people praying for her at one time. There were thousands of people from all over the world that were following her journey on facebook. Those same people were mentioning her name in services from Scotland to Iowa to Japan to Brazil to Nebraska. Her name and her needs were being shared within those congregations and included far beyond her small social circle containing family and friends back home. Imagine you’re a satellite orbiting the Earth and instead of lights of towns you see a glow for each prayer. Is it possible to illuminate the darkness with light your eyes can’t see? I say yes. In that context, there would be no dark corner on the planet at any given time regardless of the sun’s position. A garden variety atheist can agree we’re made of energy. Even rocks are energy. By that rationale alone prayer is pure and focused energy. Prayer can be envisioned by you and I in this post as light absent sight. What else is light you ask? As for commenting on the facebook post? I sometimes do, but it is darned rare. I am trying, although it is hard for me, to ask myself simple questions before I react to things in life. I ask myself, “Does what I’m about to say or do glorify God?” If that’s too complex and I can’t make sense of it, or I’m just plain mad and even simpler question will suffice like, “Is what I’m about to do helpful or not?” When I get those questions properly answered it is rare I find myself responding. Not in public anyway. Mark 7:7 – Ask, and it will be given to you; seek, and you will find; knock, and it will be opened to you.